Acacia tree on the grassland, originally uploaded by autan. There is something surreal about this image. It looks like something you might see in a dream or a vision. 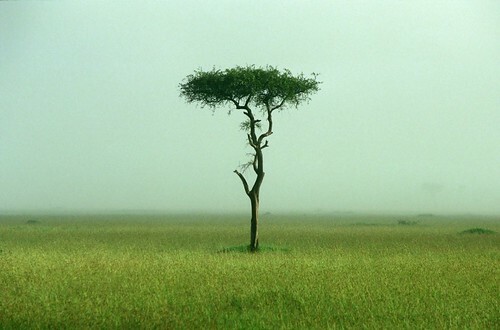 A lonely Acacia tree (which you normally see in dry desert or semi desert settings) set against a foggy background. I kinda makes you scan the horizon to see if there isn't some sort of Savannah animal like a Giraffe or Lion hiding in the background. The tree itself is standing alone. A lone tree set in an almost perfect grassy plain. It must have rained recently. This tree would be a handy tree be close to should you have an unexpected encounter with a predator. I can just imagine grabbing hold of the lowest branch and swinging myself up to the upper branches to escape the charge of a Rhino or Warthog. It also looks like a good tree for having a face to face encounter with a Giraffe. By the look of it I´d say that it´s shape has been strongly influenced by some long necked leaf eaters.